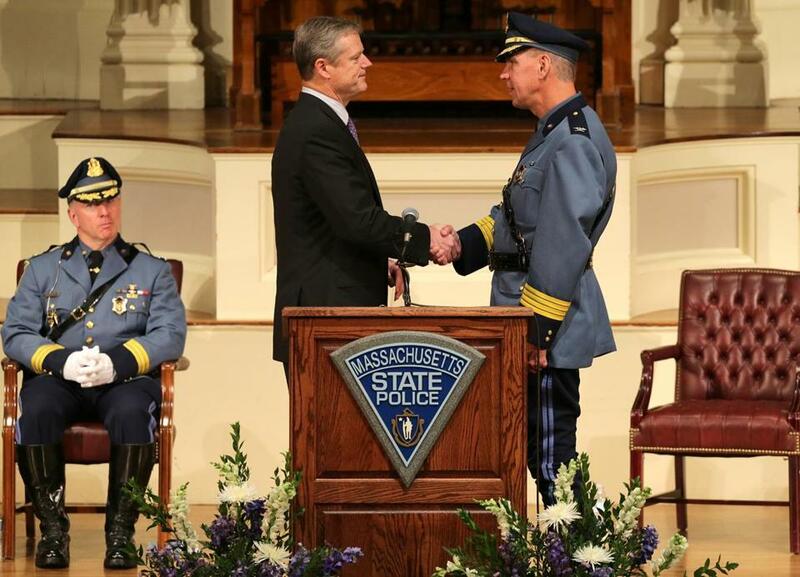 Governor Charlie Baker congratulates Richard D. McKeon, the new superintendent of the Massachusetts State Police, after he was sworn in during a ceremony at Mechanics Hall in Worcester. WORCESTER — The new superintendent of the Massachusetts State Police said Thursday that he welcomes members of the public to film troopers on the job, but asked people not to judge the force based on instances of police misconduct caught on camera in other parts of the country. Colonel Richard D. McKeon said he is open to the possibility of introducing body and dash cameras for Massachusetts state troopers, but believes the idea needs “to be refined a great deal” first. Introducing body and dash cameras to the state’s force of about 2,150 troopers would be a “huge expense” and require the establishment of a system for storing the video footage, McKeon said. State Police would also have to draft policies about when and where to use the cameras so as not to violate people’s rights, he said. 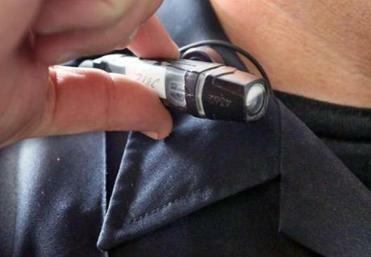 Lowell Police Department is negotiating with its police union over a 30-day trial of police body cameras. Governor Charlie Baker, who administered the oath of office to McKeon, said his administration is in talks with state lawmakers about how to test body and dash cameras on a “demonstration basis” to weigh the pros and cons. “I fully expect to see at some point some demonstrations in that area,” Baker told reporters. McKeon has assumed leadership of the State Police at a time when the deaths of unarmed black men in places such as Ferguson, Mo., New York, South Carolina, and Baltimore at the hands of police have prompted community leaders and civil rights groups to demand more police accountability. He said State Police have “solid policies” in place for using force and the agency is reviewing new technology for less-than-lethal options. McKeon declined to specify the technology under review, but said the expanded use of tasers by troopers is under consideration. “We do have a solid policy in place, and I think our record will show that we’ve adhered to that policy in the majority of instances where force had to be deployed,” McKeon said. He listed his priorities as improving technology, getting more troopers in uniform, and addressing facilities in need of attention, including constructing a new building next to the barracks in Leverett Circle and making upgrades to a firing range at the State Police Academy. McKeon said the State Police need 150 to 250 more troopers to reach optimal levels. A new class of recruits enters the academy in October and should generate 150 to 175 graduates, he said. “That’s going to alleviate a lot of the pressure that’s put on our people,” McKeon said. Another problem facing the State Police is the opiate crisis, especially use of heroin laced with fentanyl, a powerful narcotic. In 2013, the State Police laboratory handled five cases in which drug samples tested positive for fentanyl, said David Procopio, an agency spokesman. So far this year, there have been more than 470 such cases, he said. “We’ve seen a spike in heroin-, fentanyl-related deaths, and it’s certainly a big concern for us,” McKeon said. A trooper since 1982, McKeon became superintendent on July 12 and succeeded Colonel Timothy P. Alben, who retired. He previously served as deputy division commander for the Division of Investigative Services and spent many years investigating crime in Worcester County. McKeon and his wife have three children, including a son who is a trooper.